One of Canada’s most accomplished chefs, Frank Pabst’s disciplined technique—earned in some of Europe’s finest kitchens—is matched to the West Coast’s abundant harvest of seafood. 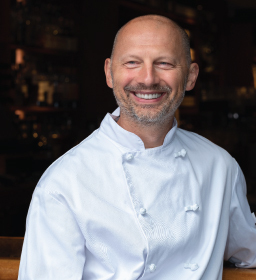 Chef Pabst enjoyed positions in Michelin-starred restaurants throughout Germany and France, including La Becasse (Aachen), the Hotel Negresco (Cannes) and Restaurant de Bacon (Antibes). Jean-Pierre holds both his Professional Apprentice Certificate and Masters degree as chef de pâtisserie, accredited after many years of apprenticeship and professional development in his native France. 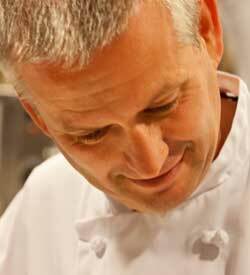 He held the position of pâtissier for 11 years in Le Cours Mazan and Bornes les Mimosas in France. He worked with Gerard Moyne Bressand in Nimes, and subsequently as Executive Pastry Chef in a number of world-class properties, including the Michelin-rated Chewton Glen Hotel in Hampshire and the Grosvenor House Hotel in London. At the helm of Blue Water Cafe’s pastry kitchen since 2005, Jean-Pierre’s desserts, breads, chocolates and petits fours are all made fresh daily. 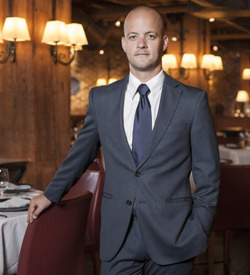 Steeped in the culinary traditions of his native France, Stephan Cachard’s sense of true hospitality is instilled in his service team, who maintain the standard of excellence synonymous with Blue Water Cafe. 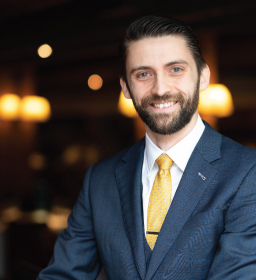 A graduate of one of France’s top catering schools, “the Osny”, Stephan’s resume travels through some of the world’s finest properties including Michelin-starred restaurants, luxury hotels and exclusive private clubs of Paris and London. 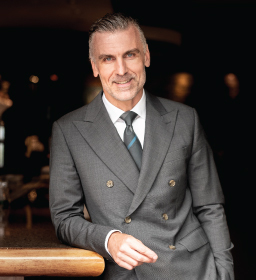 At the helm of Blue Water Cafe since 2002, Stephan is dedicated to every detail, ultimately creating a memorable dining experience for each of his guests. Adrien brings to Blue Water Cafe a formidable résumé, formed in leading restaurants in France, England, Australia and the U.S.
Beginning with his degree from CFA St. Michel Mont Mercure hospitality college, Adrien has worked at La Bastide Saint Antoine, Grasses and Hôtel du Palais, Biarritz in France, amongst others, and at Vue de Monde in Melbourne, one of Australia’s finest restaurants. 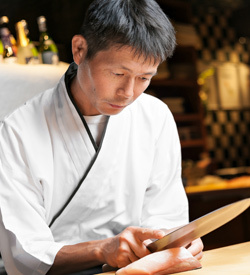 He was also a service leader at Joël, the James Beard award-winning restaurant in Atlanta, Georgia, also at Morton’s Private member club in London, England. Toronto-born William Mullholland enjoys a storied resume. 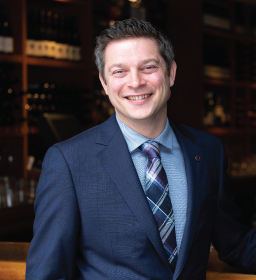 He originally set out to pursue a career in Civil and Human Rights Law following study at the University of North Texas but switched paths a dozen years ago to train in the world of wine. He currently holds Court of Master Sommelier accreditation (Levels I + II). William was further schooled at several leading restaurants in Texas before returning to Canada. He worked at Montreal’s famed Rosalie restaurant, and then at Vancouver’s Le Crocodile. He joined Blue Water Cafe five years ago. An astronomy buff, William enjoys hosting telescope parties at the beach with fellow staff members. 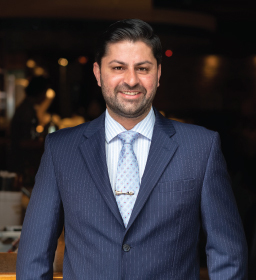 His passion for service is inspired by “my love for food, wine, culture and history – and hospitality,” he adds. “It’s all about making memories that will last a lifetime, on birthdays, anniversaries, or just because." Luke joined the Blue Water brigade in 2015 following world-wide travels from his native Sydney, Australia through Melbourne and Scandinavia, and finally arriving in Vancouver. 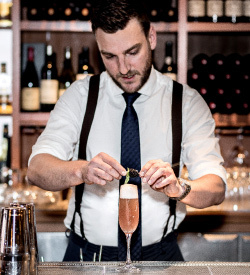 He is both a certified Bar Coach and Instructor, finalist in the Scandinavian Bar Wars Competition, and winner of the 2013 BOLS Mixology Competition. Luke has worked in Melbourne’s Marquee Nightclub and Platform 3, before joining Norway’s Metro Nightclub as General Manager, and Sinco Group, where he was Operational Manager for two years.